Across the state, businesses are generating solar energy to manage their operations costs and be more sustainable. Energy Trust makes it easy with technical assistance, valuable incentives and referrals to qualified local contractors. Energy Trust incentives and tax credits could offset up to 50 percent of system costs. 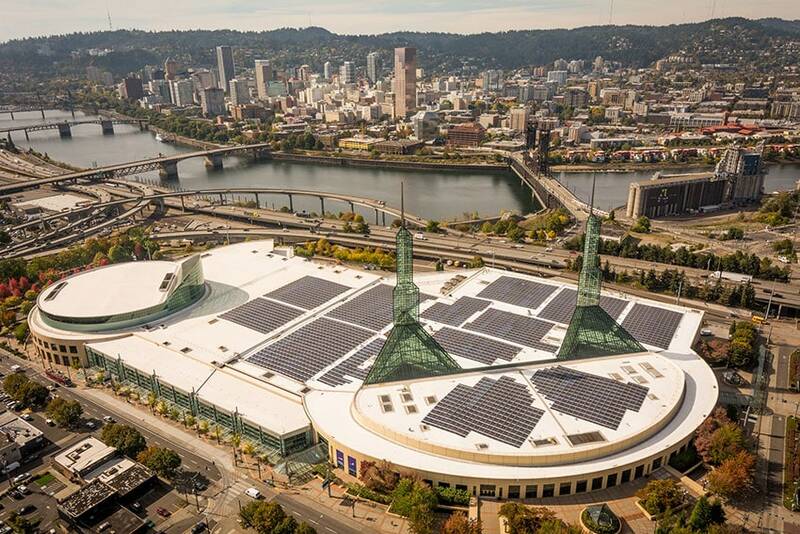 You must be an Oregon business customer of Portland General Electric or Pacific Power and working with an approved Energy Trust solar trade ally contractor to be eligible for incentives. Get proposals from several Energy Trust solar trade ally contractors. Systems must be installed by an approved Energy Trust solar trade ally contractor. Self-installed systems do not qualify. Your contractor will handle all the paperwork for your system, prior to installation. You may opt to receive your Energy Trust incentive directly or have it paid to your contractor. Your system is installed and verified. Energy Trust helps protect your investment by reviewing the plans for your system before construction. Once it’s complete, we also verify that it met our rigorous technical standards. In many cases, we will stop by in person to verify your system was installed properly. Energy Trust mails your incentive check. The check will go to you or your contractor, depending on the option you selected on your incentive application. Claim your federal energy tax credit when you file your taxes. Complete the IRS Business Energy Investment Tax Credit Form and submit it with your federal tax return. Energy Trust offers cash incentives that reduce the upfront cost of solar installations. The incentive amount depends on the size of your system and your electric utility. Portland General Electric $40,000 max. Incentives are subject to funding availability and may change at any time. Check with your contractor. Attend a free solar workshop in your area. A tax credit is a dollar-for-dollar reduction of the income tax you owe. The federal government offers a corporate tax credit and a special depreciation schedule for businesses that install solar energy systems. Nonprofit organizations and public entities are generally not able to use these benefits because they do not pay taxes. Consult your tax professional to learn how tax credits and rules may apply to you. This information does not constitute tax advice and cannot be used to avoid tax penalties. 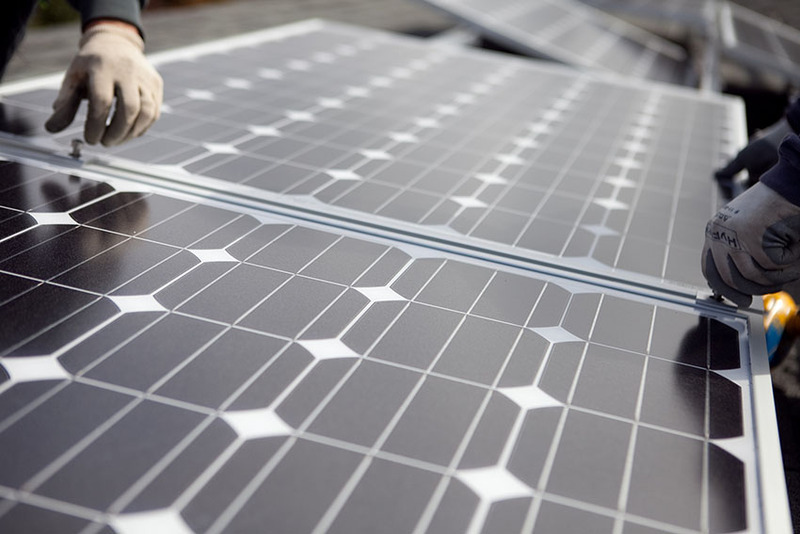 Federal Energy Tax Credit: Covers 30 percent of the cost of a solar electric system. View requirements and information on how to claim the tax credit. Federal Accelerated Depreciation: Allows businesses to depreciate the cost of a solar electric system following the Modified Accelerated Cost Recovery System. This can provide a tax deduction benefit that offsets up to 25 percent of the cost. View the depreciation schedule. Businesses have three basic options for financing a solar project: purchasing it with cash or a loan, leasing or purchasing the electricity through a solar power purchase agreement. Other financing solutions such as community solar funding or Property Assessed Clean Energy (PACE) programs are still evolving and aren’t readily available in our market. If you have the capital, paying for a solar project with cash will typically provide the highest return on investment and the quickest payback. A solar contractor can provide you a proposal with specific figures, but it’s not uncommon to achieve payback within 5 to 10 years. As the owner of the system, you will be eligible for a cash incentive from Energy Trust, which covers about 20 percent of a typical project. If you’re a for-profit business, you can also claim a Federal Investment Tax Credit and the tax deduction from the Modified Accelerated Cost Recovery System (MACRS). Together, these tax benefits can reduce your gross project cost by up to 55 percent. An Energy Trust incentive and the tax benefits can lower the cost of the project by up to 75 percent. These same advantages apply if you use a business loan to pay for some or all of your system. There are a number of lenders that offer financing specifically for solar. Another option is to install a solar system using a lease. With some lease arrangements, there is little or no upfront cost to the business hosting the system. There are two common types of commercial solar leases: a capital lease and an operating lease. A capital lease is similar to a long-term loan but it has a small buyout payment at the end of the term (often one dollar). You claim the incentives, the tax benefits and the energy savings from the electricity. Under an operating lease, which is sometimes referred to as a true tax lease, the lessor effectively owns the solar electric system. You pay a monthly payment to the lessor in exchange for receiving the electricity and utility bill savings from the system. The lessor generally receives the Energy Trust incentive and claims the tax benefits. At the end of the term, there is an option to renew the lease, purchase the system at fair market value or remove the system. Under a power purchase agreement (PPA), a solar service provider purchases, installs, owns and maintains the solar electric system. They provide any necessary financing and receive the incentives and tax benefits for which the project qualifies. In exchange, you purchase the electricity produced by the system for the duration of the agreement, usually 20 years in Oregon. The solar service provider pays for the equipment, installation and most necessary maintenance on the system. The rate you pay for the solar electricity may be less than your current electricity rate. You benefit from slightly reduced utility costs (if your solar PPA rate is less than you utility rate) for the duration of the agreement. At the end of the term, you have the option to remove the system, renew the agreement or purchase the system. Energy Trust keeps a portion of the Renewable Energy Certificates produced by projects that receive an incentive. Energy Trust will share ownership of the Renewable Energy Certificates with whomever owns the system, be that you or a lessor or a solar service provider. Read this fact sheet for more information on Renewable Energy Certificates.